This article is part of a series on setting up a private nuget server. See below for links to other articles in the series. Packaging up your nuget package and pushing it to your feed is surprisingly simple. The actual push may vary depending on whether you are using a hosted service such as MyGet/VSTS or using your own server. If you’ve gone with a third party service then it may pay to read into documentation because there may be additional security requirements when adding to your feed. Let’s get started! If you have gone with building your library in .NET Standard (Which you should), then the entire packaging process comes down to a single command. Inside your project folder, run dotnet pack and that’s it! The pack command will restore package dependencies, build your project, and package it into a .nupkg. I’m not a huge fan of this as it means the version will be managed by your build system which can sometimes be a bit hard to wrangle, but it’s definitely an option if you prefer it. System.InvalidCastException: Unable to cast object of type 'System.String' to type 'NuGet.Frameworks.NuGetFramework'. After a quick google it seemed like I wasn’t the only one with this issue. Switching to the dotnet pack command seemed to resolve it. Publishing might depend on whether you ended up going with a third party hosted nuget service or the official nuget server. A third party service might have it’s own way of publishing packages to a feed (All the way to manually uploading them), but many will still allow the ability to do a “nuget push” command. Again this command is supposed to map directly to the underlying nuget.exe command (And it actually worked for me), but it’s better to just use the dotnet command instead. If you are using a build server like VSTS, Team City, or Jenkins, they likely have a step for publishing a nuget package that means you don’t have to worry about the format of the push command. For my actual nuget server, I ended up going with Microsoft VSTS as the company I am working with already had their builds/releases and source control using this service. At first i was kinda apprehensive because other VSTS services I’ve used in the past have been pretty half assed. So color me completely surprised when their package hosting service was super easy to use and had some really nifty features. Once a feed has been created in VSTS, publishing to it is as easy as selecting it from a drop down list in your build. 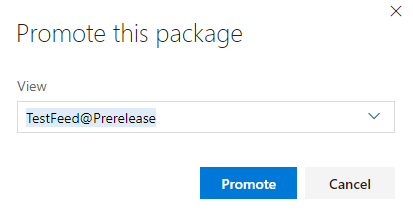 After publishing packages, you can then set them to be prerelease or general release too. In a small dev shop this may seem overkill, but in large distributed teams being able to manage this release process in a more granular way is pretty nifty. You can even unlist packages (So that they can’t be seen in the feed, but they aren’t completely deleted) see a complete history of publishes to the feed, and how many times the package has been downloaded. Without sounding like a complete shill, Microsoft definitely got this addon right. So that’s it. From setting up the server (Or hosted service as it turned out), developing the packages (Including wrangling version numbers), and putting everything together with our build server, it’s been surprisingly easy to get a nuget server up and running. If you’ve followed along and setup your own server, or you’ve already got one up and running (Possibly on a third party service), drop a comment and let me know how it’s working out!